Many Christians (including their Hebrew Roots or messianic co-religionists) believe that the Jewish people will not celebrate and rejoice when their messiah comes, as Jews believed for thousands of years. At least this will certainly not be their first reaction at all. Christianity has always held and still does, that Jews will instead grieve and mourn when Jesus returns to earth during his “second coming”. Jews will be ashamed and embarrassed at the sight of Jesus! According to many Christians, the whole of Israel will be stricken to its heart because “they killed Jesus” during his first coming, have “sinfully” rejected him both as messiah and god, and thus suffered all this time for obstinately refusing to worship Jesus as god or the the son of G-d. But will this really be the case or are these Christians grossly mistaken in their view of the future of Israel? Will Jews really mourn their disbelief in Jesus as many in the Christendom predict? Or, will something quite the opposite happen? Will Israel instead rejoice when their messiah comes, while those who clung to their lifeless idols (including Jesus) and those who for thousands of years tried and still try to missionize the Jewish people into worshiping a man Jesus, will it be they who will be ashamed and mourn their idolatry? Christians get their understanding of events during Jesus’ “second coming” in part from Zechariah 12:10 as it is being used by the gospel of John in verse 19:37. In that New Testament book, besides misquoting who is being looked upon (probably in a clumsy attempt to deify Jesus), the author of John uses this out of context passage to claim that it was the people who were actually crucifying Jesus who were the same people looking on at him at the time of his crucifixion (which were Romans and not Israel during Jesus’ “second coming”, as Christians claim for Zechariah 12:10) . John explicitly says that it was that instance of “looking” the “fulfillment” of the scripture. And since it was Romans who were crucifying Jesus and not Jews (who were supposed to be celebrating Pesach at the time and not attending Roman crucifixions of their fellow Jews), John’s words can’t even be applied to Israel as a fulfillment of Zechariah. 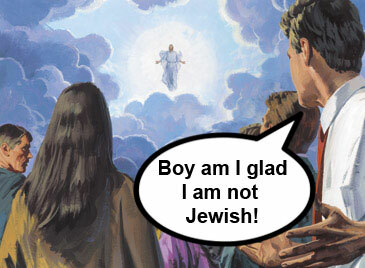 Jews were neither piercing Jesus (a Roman solider did that) nor were looking on at him (his Roman abusers were). In fact, it becomes clear to those who are willing to look at things from a historic point of view, that the crucifixion order of events was falsely constructed and blamed on Jews by later Church scribes. A charge of deicide and a blood libel, one among many that Jews had to suffer from professing Christians during the ensuing centuries. Instead of their Roman abusers, it was their repressed Jewish victims who got blamed for the death of their fellow countryman. The occupying Roman power, which spared no messianic claimant before or after Jesus, escaped all blame. No wonder nobody ever calls modern Italians “Christ-killers”! When we read Zechariah, the prophet speaks of someone (or multiple people symbolized by one person, as common in Biblical Hebrew) who is slain after a great battle. This event appears to be the prophesied battle of Gog and Magog, a savage confrontation during which all the nations of the world will gather together to attack the Jewish people. We read that the attacking nations will utterly fail in their bid to destroy Israel, and instead will find themselves be destroyed by G-d’s intervention, when He personally will fight on Israel’s behalf as He did throughout Israel’s history. There will be at least some casualties among Jews, and this will apparently be what Israel will be mourning at that time. When the Lord will reveal His kingship, the earth will exult; the multitudes of islands will rejoice. Clouds and dense darkness will surround Him; justice and mercy will be the foundation of His throne. Fire will go before Him and consume His foes all around. His lightnings will illuminate the world; the earth will see and tremble. The mountains will melt like wax before the Lord, before the Master of all the earth. The heavens will declare His justice, and all the nations will behold His glory. All who worship graven images, who take pride in idols, will be ashamed; all idol worshippers will prostrate themselves before Him. Zion will hear and rejoice, the towns of Judah will exult, because of Your judgements, O Lord. For You, Lord, transcend all the earth; You are exceedingly exalted above all the supernal beings. You who love the Lord, hate evil; He watches over the souls of His pious ones, He saves them from the hand of the wicked. Light is sown for the righteous, and joy for the upright in heart. Rejoice in the Lord, you righteous, and extol His holy Name. In this psalm we read that, first and foremost, those who have worshiped idols, who took pride in them, they will all be ashamed. This will be the first order of the day in the Messianic Kingdom. All of those who worshiped false gods will come to prostrate themselves before the G-d of Israel in Jerusalem, as the Jewish prophets foretell elsewhere in the Bible. It will not be a small number of nations either (e.g. not just folks like Hindus in India or a some scattered pagans), but it will be many peoples, perhaps all nations, who will come to G-d and admit that they have inherited nothing but lies and created their own false gods. The second thing that happens, according to this psalm, is that “Zion will hear and rejoice, the towns of Judah will exult, because of Your judgements, O Lord.” When G-d reveals His Kingship, He will judge the nations and will rectify all of the injustices committed against His people Israel for many thousand of years (Isaiah 66). Jews will stream in joy to Israel from every country and island. They, as a people, didn’t trade their G-d for another, and will be vindicated in the sight of all the nations! There will be joy in every Jewish household as in the days of Esther and Mordecai. They will rejoice at G-d’s salvation and they will greatly rejoice when G-d restores a Davidic king to his throne as He promised, a messiah who will be Israel’s righteous G-d-fearing prince. But there will also be much rejoicing among those Gentiles who have completely rejected idolatry that they inherited from their forefathers and joined themselves in solidarity to Israel – they will have little to be ashamed about when they stand before the G-d of Israel. ← Article: How Does a Jew Attain Salvation? Christianity claims that by rejecting Jesus, by not accepting him either as messiah or a deity, Jews (those who survive death and destruction of being judged by G-d for their refusal to worship Jesus) will be shamefaced when Jesus finally returns. The Jewish people(but apparently not the Romans) will horrible for “murdering Jesus” 2000 years ago and will collectively cry about it. Is there any truth to these claims and what does the Hebrew Bible have to say about it? Yes, but before they (the idolaters) morn and be ashamed and repent, they will tell us that the messiah is the anti-christ because he has not come in the clouds of heaven. And the idolaters will go and attack Jerusalem, because the messiah will forbid the idol worship of Jesus and I guess they will not like that. Only after the defeat of all the nations will they realize they were wrong and be ashamed.